Two Bizspace staff, including MD Gareth Evans raised more than £3,000 between them when they braved the two-day 190 mile London Revolution cycle ride. At Bizspace we love a good boost to staff morale, so it was great to see two members of our senior management team complete a ride of a lifetime to raise more than £3,000 for charity. 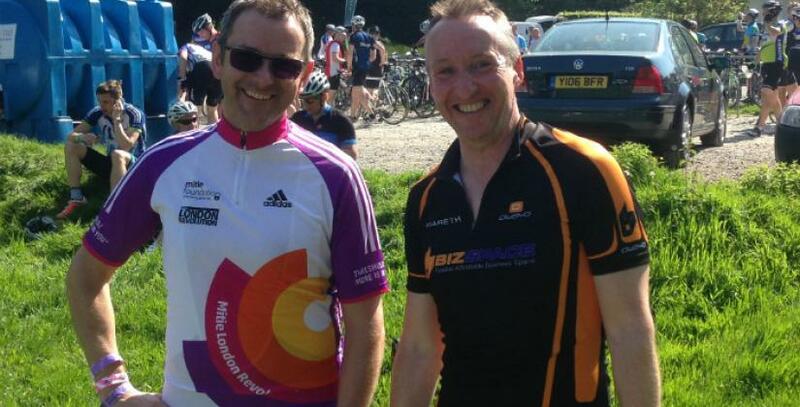 Managing Director, Gareth Evans, together with our commercial property Building Surveyor, Andrew Ainsworth, braved 190 miles and two days in the saddle to raise the impressive sum. The pair enjoy cycling as a pastime and began more intensive training earlier this year to prepare for taking part in the Mitie London Revolution event – the longest route either had yet tackled. “I was very nervous beforehand, but, as it turned out, the pace of the event was somewhat more sociable than in training and combined with good nutrition and hydration, we managed to keep going,” Gareth, who is based at our London head office, says. Gareth is raising money for The Alzheimers Society as his mum has the condition, while Andrew is supporting Parkinson’s UK because his father is a sufferer. The combined total raised now stands at £3,300 – smashing the pair’s target of £1,500. The London Revolution is a loop around the capital, which takes in the iconic climb up Box Hill, made famous at the 2012 Olympics, as well as a home run through the city itself and over the impressive spectacle of Tower Bridge. You can still donate to Gareth or Andrew’s causes at www.justgiving.com/Gareth742 or www.justgiving.com/AndrewAinsworth.